We Are the Weavers is very much a painting about the power of community. The painting is a metaphor about our need for each other and that we really can’t get through this life alone. When we weave ourselves into a community, we become a part of something strong, supportive, and vital to our existence. Like how the threads of a spider web work together to create something impossible to achieve with only a single thread, community is built from all of us, and community becomes much more than any individual could be or enable alone. 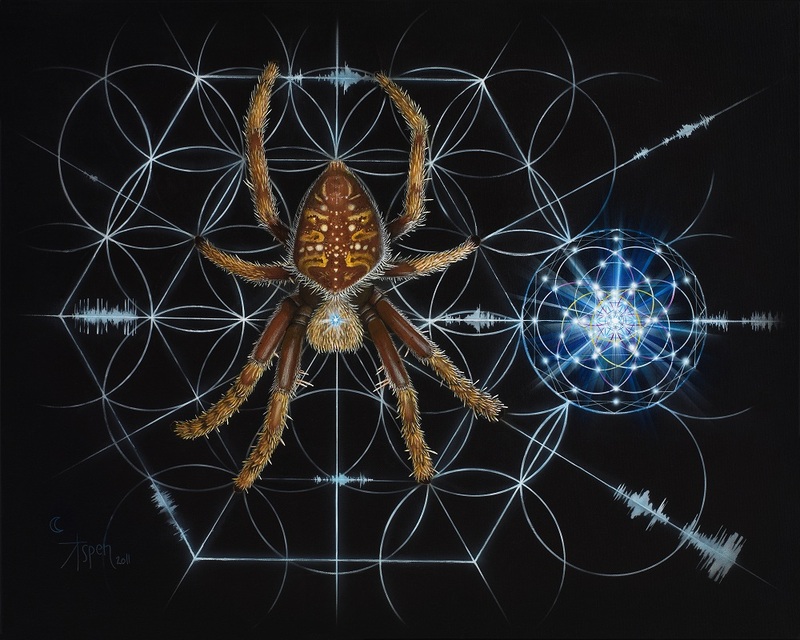 The portal to the right of the spider represents the ultimate potential and unlimited opportunities—creative, spiritual, physical, mental, sexual, social, emotional, experiential, experimental—of not only the community but also the individual. Known and unknown. Notice that the web is what holds open this portal of light and creative potential. Luckily, I am blessed (overwhelmingly so) to be accepted into a community of hundreds of talented and industrious friends to co-create with. In the past, I’ve received invitations to be involved in stage performance, large event production, art curation, fire art, and all kinds of good times that have expanded me, given me amazing thrills and adventures, taught me, taken me to far away places, and dazzled me to no end. Never in my wildest imagination would I have thought I’d work professionally as a fire eater, or circus performer, or that I’d curate fine art shows, direct large, multi-faceted stage shows, or risk serious injury on 6-foot stilts in front of thousands… I was taught to expect the desk job and retirement. Well, yes I do have the desk job. Which helps keep the car and fridge full. But in addition I’ve created and expressed outside of that. I’ve worked at many prestigious (and not so prestigious) festivals, parades, and events. I’ve been on TV (and now cable, thanks Renee) so many times I’ve lost count. And none of this happened solely on my merits. In fact, it was almost never that way. It was through the invitation of others that my vivid reality has unfolded. Nevertheless, it was my participation (i.e. saying Yes! and not just watching it on TV) in a rich art community that worked to foster and create more and more and more. It’s kind of interesting to consider this, but We Are the Weavers is my first ever serious attempt at a canvas painting. And strangely, I never myself intended to make this thing happen…this painting came into being through an invitation to paint live at an event—the first invitation ever. A group of artists, musicians, and damn good-looking bohemians that call themselves The Hive Collective produced the event and opened the door for me (now go look at the portal on the right and think about it). I can’t tell you how flattered I was to have this chance—and how nervous. Nevertheless, Weavers is the result of that one invitation! This painting is very much about my personal journey to walk through that cosmic portal, and thrive in a reality too amazing to have created or imagined by myself—in fact, it was a reality I had struggled to find on my own. As I’ve said before, painting had always intimidated me, so never tried!! But with the help and support of my community, I have moved beyond that and begun to discover parts of myself that were inaccessible to me without the help, inspiration, support, and encouragement of others. I’m sure those people don’t really know how much they gave me with that invitation. I suppose that the art I create from then until forevermore will have them (those who held open the portal for me…) to thank!! Kristen, Rebecca, DeCay, Lala—being woven into a reality with you all has changed my life forever! I’m on my way to being the artists I wanted to be because of you. Gratitude abounds. The mother spider in the painting is a very common type of spider called a garden orb weaver. Orb weavers and ubiquitous, and well-known for the beautiful, spiralling webs they create. If you see one in your garden, it’s an indication that your environment is healthy and thriving. The spider represents a nurturing or muse type of energy that does the weaving. Her web is created through and by sacred geometry and the flower of life, representing the deep natural order (i.e. structure) of things and that community that is in harmony with nature is where we all thrive. The threads, as mentioned, represent us—you, me, everyone. I think it’s no coincidence in how the weaver works. She takes these threads and weaves them into perfect order. Running through the web is a pulse. A heartbeat is essential for any animal, so I’ve included sound waveforms a reference to the heartbeat of our community. In Salt Lake City (and this night was no exception), we get together regularly to dance. Music is thriving here and creating a stage for many other arts to thrive as well (live painting, for instance). So the waveforms used for the painting came from one of the music producers of the Hive Collective. DeCay debuted a new song of his the night I did this painting. So I used that song’s waveform to represent the pulse, or energetic life force that any community needs to sustain it. Moreover, the Hive Collective has been regularly producing amazing events that bring our community together; hence the hive reference in the web. 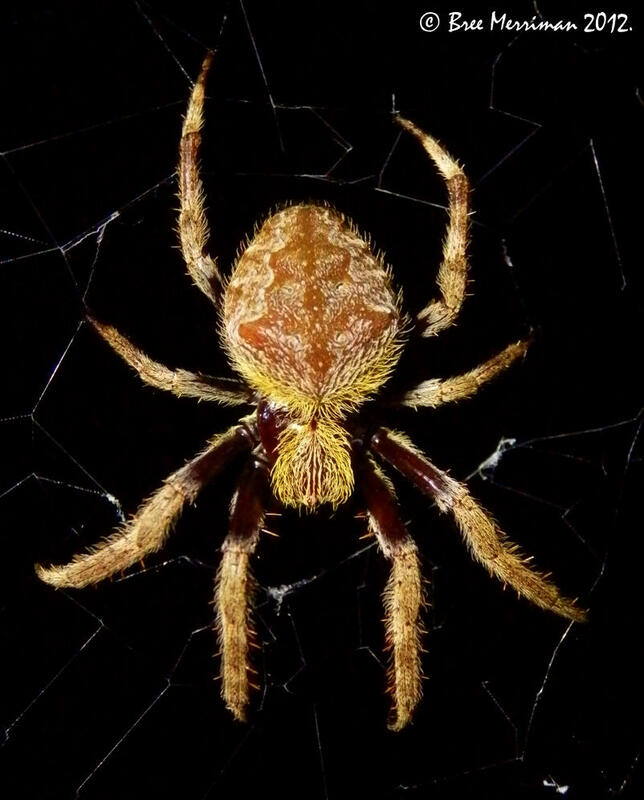 Energy in the form of sound or movement swirls all around the spider, but with the web, the spider extends its perception, focuses it, and can be aware of every part of the web all at once. The mother spider is acutely aware of every part of the web, with her legs aligned with the geometric web of creation. Ultimately, the portal is an important place of meditation in this artwork. It is where you find your emotionally highest, most elevated, most beautifully fulfilled self. And it is a place wholly created and sustained by the others in your reality. Put yourself in the place of the mother weaver and work through it again. Allow your imagination to fall deep into the portal. Try to understand what makes all of it so. And know that (y)our ultimate potential is very possible both because we weave and because we are woven. -am.